Are you the person who always organizes the family reunions, the friends birthday parties, and the school fund-raisers? Have you thought about becoming an event planner but hesitated about putting your plans into action? This comprehensive guide contains all the necessary tools and strategies you will need to launch and grow a successful business. 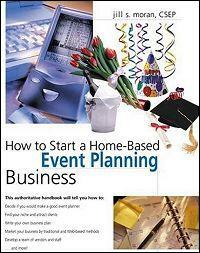 This insider's handbook reveals how to start a successful business planning a wide variety of events from home. Topics covered include purchasing equipment and supplies, writing a business plan, working with caterers and other service professionals, attracting and keeping clients, dealing with legal and accounting issues, and more. Also included is information on professional organizations to join and places to learn more about the event-planning business. Author Jill S. Moran, a Certified Special Events Professional, shares her experiences and advice on every aspect of setting up and running a thriving home-based event planning business. From finding customers to staying in touch with the latest trends and techniques, her step-by-step methods are practical and easy to understand. She even includes "war stories" from other event planners so that you can avoid their mistakes! Reader Kathryn Murphy from Roanoke, Virginia says, "I highly recommend this book to anyone who is considering a career in the event planning industry. The author, Jill Moran, shares so much information with her readers - more than most "how to" instructors. I was so pleased with the way she mapped out the entire process. She's very thorough; it's plain to see that she's an industry expert. She also cites many excellent resources for those who are new to event planning. I am very satisfied with this investment. It will serve as a terrific reference tool as I take steps to launch my own business.